It has been a while since I have introduced a blog post from my favorite entertainment blog last time. 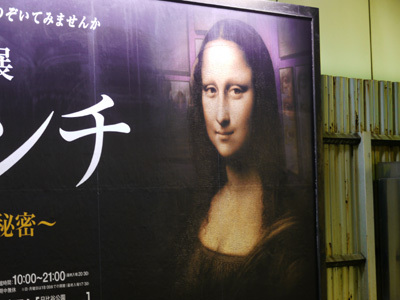 Today’s topic is Japanese famous actress Koyuki and Mona Lisa. The woman in the picture is Koyuki. 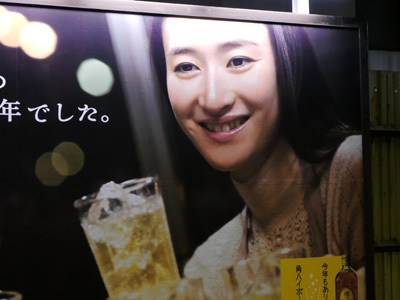 It is an advertisement for whiskey. This blogger thought that she looks like Mona Lisa in a way. 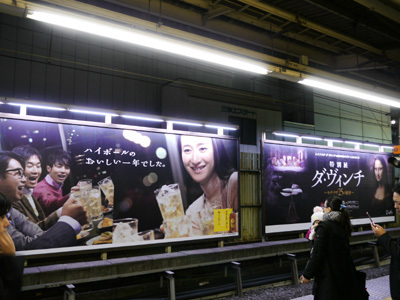 When the blogger saw these 2 advertisements next to each other in Shinjuku station, the idea came across to him. Now he mentioned it, her feature is similar to Mona Lisa’s. There might be TV newscaster and models who use Mona Lisa’s feature as a reference outside Japan. Mona Lisa’s feature has got to be very perfect. Say, I do not know if Koyuki’s advertisement is conscious of Mona Lisa or not.